'Genesis,' The Newest GMA-7's Primetime TV Series Starring Dingdong Dantes Premieres Tonight! 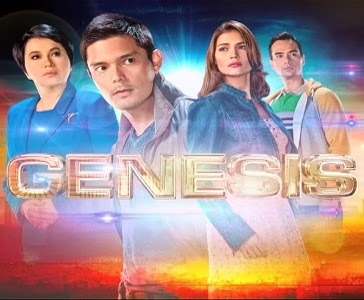 GMA’s newest primetime program “Genesis,” which will air its pilot episode tonight. The ground-breaking series promises to take the audience on an emotional and inspiring ride towards a new beginning. Set during the end of times, it will test the endurance of the human spirit and prove that when hope falters, love is the greatest refuge. Primetime King Dingdong Dantes portrays Isaak Macalintal, a morally upright military man who is entrusted with the welfare and safety of the country’s vice-president. The story of “Genesis” begins when a series of cataclysmic events happen in Baguio City during the celebration of the annual “Panagbengga Festival.” The festive occasion turned tragic when an asteroid hit the city, followed by a powerful earthquake and several landslides. In the middle of the chaos, Isaak saves the vice president’s daughter Sandra (Ms. Lorna Tolentino) and takes her to the presidential chopper. He then returns to ground zero to rescue the vice president. However, the president, Ramona (Jackie Lou Blanco), orders the immediate take off of the chopper even if the vice president is still in grave danger. Isaak finds the vice president, hanging on to the ground at the edge of a wide and deep crack on the ground which resulted from the earthquake. He desperately tries to save him but it was too late. The incident leaves Isaak devastated and feeling dishonored because he failed in his mission. When Isaak returned home, he finds out that his parents perished in the disaster and his fiancée, Raquel (Rhian Ramos) was the only one who survived among his loved ones. As the days go by, Isaak continues to mourn the death of the people dear to him. Aware of the danger that comes with it, Raquel convinces Isaak to quit his job. She wants them to get married and start life anew in their quiet hometown. Back in the country’s capital, Sandra still doesn’t know that his father’s death was partly due to President Ramona’s decision. She and Isaak are both unaware that Ramona had wanted the vice president killed because he was a roadblock to her political career. Ramona knows that the vice president’s blood is on her hands and she wants to pass the blame to someone else. She is well aware that her political ambitions could be over once someone finds out what she has done. Someone should answer for the vice president’s death and that someone is definitely not her. And so, she devices a plan which will incriminate the slain politician’s security detail, Isaak. Being a military man, Isaak’s case was unjustly tried in a military court martial. Soon, a verdict is reached and the court finds Isaak guilty of not performing his duty. Consequently, he is sentenced to life imprisonment. Later on, the president announces that Isaak died in prison. This of course, isn’t true. Thinking that the love of her life is dead, Raquel tries to move on and later marries Paolo (TJ Trinidad) who promises to give her and her baby a better life. Seven years later, Sandra runs for the presidency and wins the race. But right after her inauguration, she immediately faces a very big problem which involves not only her country but the rest of the world as well. She discovers that the world is about to end and realizes that what happened seven years ago in Baguio (which killed his dad) was a warning sign of the imminent doom. Sandra, being the president of the Philippines, must quickly assign someone to scour the country for potential candidates, and she knows who has both the agility and courage to do the job -- Isaak. She discovers that Isaak is still alive in prison and so he gives him presidential pardon and offers him the Herculean mission. In return for the favor, Isaak is assured by the president that he and Raquel can come along. In the course of doing his job, Isaak crosses path with Raquel and finds out that she is already married to Paolo and has a daughter, 7-year old Osie. Through her innocence and charm, Osie unwittingly brings back the hope and optimism in the heart and mind of Isaak. His years of imprisonment have hardened his heart and made him cynical about life. Isaak later finds out that Osie is not Paolo’s daughter but his. Apparently, he had impregnated Raquel before he was thrown into prison. In his search, Isaak meets different people from different parts of the country. He realizes that in the midst of destruction, love is the greatest salvation and that when chaos strikes, love will be their greatest strength. While “Operation: Genesis” seems promising, will it be successful in guaranteeing the future of humanity? Will Isaak be able to find all of those who are on the list? Will he be able to save himself, Raquel and their daughter Osie not only from the impending apocalypse but from Paolo who will do everything to keep Raquel away from Isaak? Could Sandra do something to save as many people as possible? Could she save her own family from her archrival Ramona? Helmed by directors Bb. Joyce Bernal and Mark Reyes, “Genesis” will showcase the basic goodness of mankind and show that we are all capable of love, hope, faith, forgiveness and sacrifice. It seeks to remind us that when we are faced with adversities, there is a future to hope for if we have love in our hearts because love sees no end. “Genesis” is top billed by Primetime King Dingdong Dantes with Rhian Ramos and Ms. Lorna Tolentino. Playing equally vital roles are versatile actor TJ Trinidad as Paolo de Guzman, the controlling and almost tyrannical husband of Raquel and seasoned actress Jackielou Blanco as Ramona Escalabre, the cruel, manipulative and dishonest former President. Completing the powerhouse cast are Irma Adlawan as Tiya Fely, Raquel’s auntie who plays a second mom to Raquel; Ronnie Henares as Emil Trinidad, Sandra’s supportive and committed husband; Carlo Gonzalez as Waldo, the warden that will make Isaak’s life miserable; Betong Sumaya as Tolits Dimagiba, an ex-convict who will be Isaak’s friend; Luane Dy as Jill Galvez, a resilient, audacious and persistent journalist who will investigate everything about Operation: Genesis; Sasha Baldoza as Osie de Guzman, the smart, charming and loveable love child of Raquel and Isaak; Rainier Gison as MJ Trinidad, the eldest son of Sandra and Emil; and Annette Samin as Summer Trinidad the daughter of Sandra and Emil who has Down Syndrome. Aside from the stellar ensemble, there will also be a special participation of respected TV and movie stars: Robert Arevalo (as the Vice President and Sandra’s father), Bembol Roco, Gardo Versoza, Snooky Serna, Shamaine Centenera, Mark Anthony Fernandez, Angel Aquino, Pauleen Luna, Lauren Young, Lito Legaspi and Laurice Guillen (as Isaak's parents) among others.